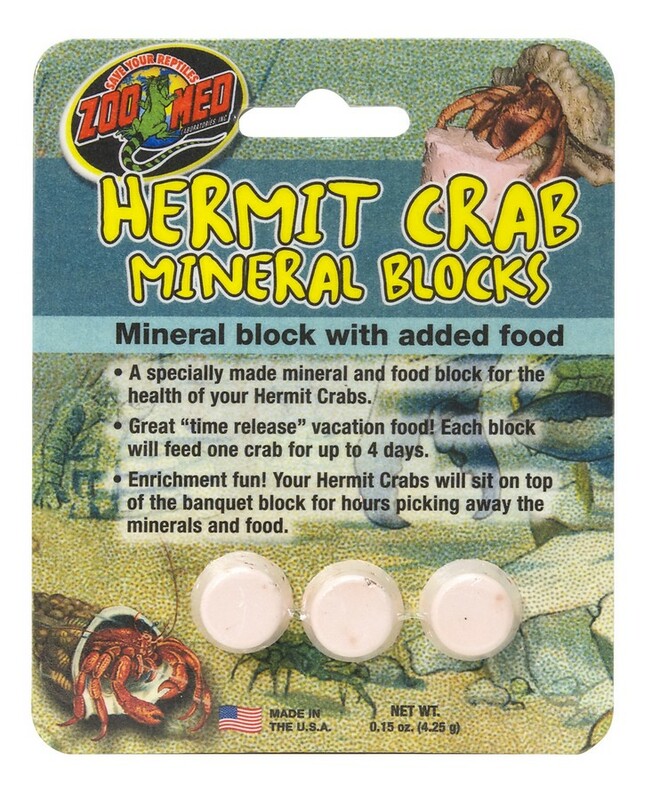 Hermit Crab Mineral Blocks | Zoo Med Laboratories, Inc.
A specially made mineral and food block for the health of your Hermit Crabs. Great “time-release” vacation food! Each block will feed one crab for up to 4 days. Enrichment fun! Your Hermit Crabs will sit on top of the banquet block for hours! Calcium Sulfate, Fish Meal, Wheat Flour, Squid Meal, Soybean Meal, Krill Meal, Fish Oil (preserved with Mixed Tocopherols and Citric Acid), Shrimp Meal, Dehydrated Beets (added color), Lecithin, Garlic Powder, Iron Oxide, L-Ascorbyl-2-Polyphosphate (stabilized Vitamin C), Dicalcium Phosphate, Choline Chloride, Niacin, Thiamine Hydrochloride, d-Calcium Pantothenate, Pyridoxine Hydrochloride, Biotin, Beta Carotene, Vitamin E Supplement, Riboflavin, Thiamine Mononitrate, Folic Acid, Vitamin A Supplement, Vitamin D3 Supplement, Vitamin B12 Supplement, Manganese Sulfate, Zinc Sulfate, Ferrous Sulfate, Copper Sulfate, Sodium Selenite, Potassium Iodate, Astaxanthin (added color), Canthaxanthin (added color), Propionic Acid (preservative), Rosemary Extract (added flavor).